Compared to the crazy run-up to Christmas, January and February are usually fairly quiet periods – but 2018 has started at quite a speed for us at Paul Rhodes Bakery. In addition to the usual business of the bakery and meeting our customer requirements we have been looking at different aspects of how we operate and working on some new products, using different grains. I also went to Paris in February. It started as a visit to the Europain trade show, which I’ve attended regularly over the past decade or so, but I added an extra day or two to visit a range of leading boulangeries and patisseries in the city. Europain has long been a leading show for people in the bakery and pastry sector but for the first time I came away a little disappointed. The show seemed smaller this year, the sessions I attended were not as dynamic and informative as I was hoping for, and so much seemed to be geared towards larger manufacturers and factories – not craftspeople with bakeries. That said, I did have some useful conversations and met one or two suppliers I might look to work with – but my overriding outtake was that I’m glad I have the business I do. Our focus has always been to keep close to the needs of our chef customers and to maintain traditional, handcrafted skills. When you’re too big, none of that is possible. I arrived seeking inspiration and hoped to come away enthused by some new knowledge or changes of direction in the industry – but instead, the whole experience just served to confirm that where we are now – as we roll into our fifteenth year – is a good place to be. The visits to the various boulangeries and patisseries however, were much more useful and inspirational. We pride ourselves on producing some of our breads and pastries in a traditional French style – but it is important to keep benchmarking and of course, to see what else may be out there, especially as there have always has been so many talented, high-profile French chefs and bakers. Paul Bocuse comes immediately to mind: this leading light of nouvelle cuisine and founder of the prestigious Bocuse d’Or award sadly died at the end of January. After looking at – and eating – a great many delicious products across the city I felt reassured that we remain on the right track and could most definitely compete with many of Paris’ finest. There was one real standout experience: the incredible Ten Belles Bread on Rue Breguet. Their sourdoughs were some of the best I’ve ever tasted and the open, lab-like kitchen, with all its theatre, made a lasting impression. Ten Belles Bread is a bakery-coffee shop led by young chef duo Ana Trattles (formerly of London’s St John) and Alice Quillet, and it’s definitely worth a detour to the 11 th arrondissement if you are ever in Paris. It has a range of incredible breads, imaginative savoury offerings, great cakes and perfect coffee. I know I’ll be going back. So, I am now all fired up, especially about creating an even better sourdough – it’s just that the inspiration came from one loaf in a small outlet, rather than a major industry gathering. 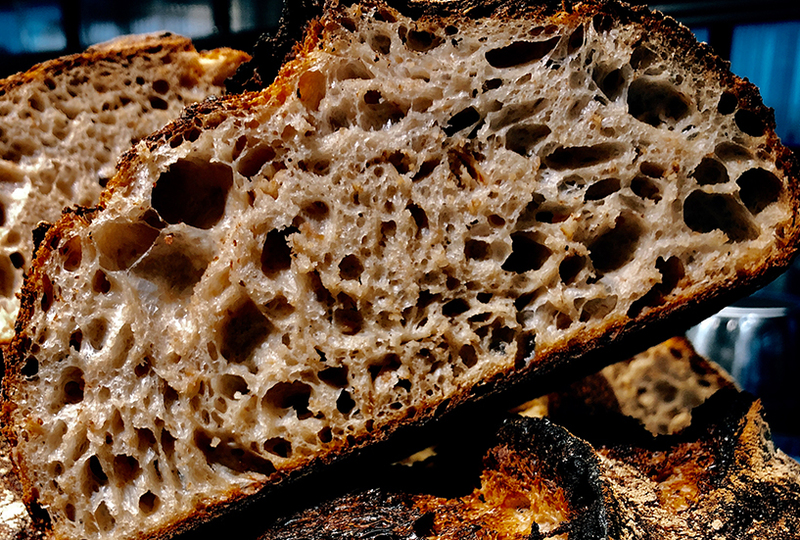 Sourdough has long been the Holy Grail – or Everest – for bakers, and changes in flour type, proving time, how you knead or proportions of flour, water and salt, can markedly change the loaf. My chef’s whites are back on and I’m working with my senior bakers to experiment and explore what more we can do with developing our naturally leavened breads – so watch this space. Mind you, I have a feeling that even if we create what I think is an even more perfect sourdough, I’ll still want to improve it further. In that way sourdough is not so much the baker’s Everest, as you’re not going to stop once you get there. It’s probably more like the Greek myth of Sisyphus…he was the chap destined to eternally roll a rock up a mountain as every time he reached the top it rolls back to the bottom and he has to start again!